Around one million Cuban immigrants came to America thanks to the open-door border policy opened by the 1966 with Cuban Adjustment Act. Almost 50 years later, America’s first viable Cuban-American presidential candidate Sen. Marco Rubio (R-Fla.) is considering closing that door. In a press conference at the American Society of News Editors this week, Rubio said that he would “re-examine” the so-called “wet foot, dry foot” policy that gives Cuban migrants a blank check on asylum claims, green cards, and federal benefits. "I don't criticize anyone who wants to go visit their mom or dad or their dying brother or sister in Cuba," Rubio told reporters. "But I am telling you it gets very difficult to justify someone's status as an exile and refugee when a year and a half after they get here they are flying back to that country over and over again." Rubio has voiced concern over the Cuban Adjustment Act before, but it is the first time that he’s elevated the issue during his presidential campaign. 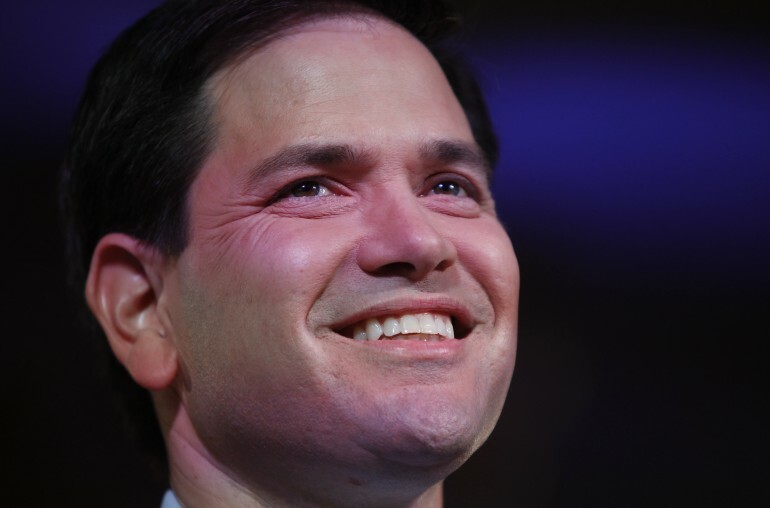 A son of Cuban immigrants (who were not asylum-seekers), Rubio has walked a delicate line throughout his campaign. On one hand, he holds up his story as a the epitome of the American Dream, while promoting policies that would snuff out the aspirations of many migrants. The senator also announced that he will introduce a bill in the Senate next week that would curb federal assistance to Cuban migrants admitted under the act such as food stamps and Medicaid, according to the Miami Herald. "We have people living in Cuba off Social Security benefits. They never worked here," Rubio said at a campaign stop in Bedford, New Hampshire. "This is an outrageous abuse, and I have a law that we are going to introduce this week that shuts down this issue. It's wrong." Marco Rubio has toughened his immigration rhetoric on the campaign trail, mixing interlacing immigration and terrorism concerns in his stump speeches, according to Bloomberg . Associating immigrants with ISIS may complete the candidate’s 180 on immigration reform. Depending on how far Rubio attempts to restrict the federal benefits granted to refugees, the move to cut food stamps and other assistance might mark a major flip as well. Unlike many of his Republican colleagues, Rubio has held up social safety nets as a key component of entrepreneurship. “I don’t take my children to the circus very often,” he told The Economist in 2014, “but when I do I have noticed that acrobats tend to be much more daring when they have a safety net beneath them,” adding that such a landing “is essential for the success of the free enterprise system”. Is Rubio trying to reign in isolated cases of abuse and correct the Cuban immigration anomaly or pulling away the safety net of immigrants once considered refugees? Let us know your thoughts in the comments below.